my life homemade: Start The Summer Off Right. Win $1000! Start The Summer Off Right. Win $1000! Let's start the summer of right!!! 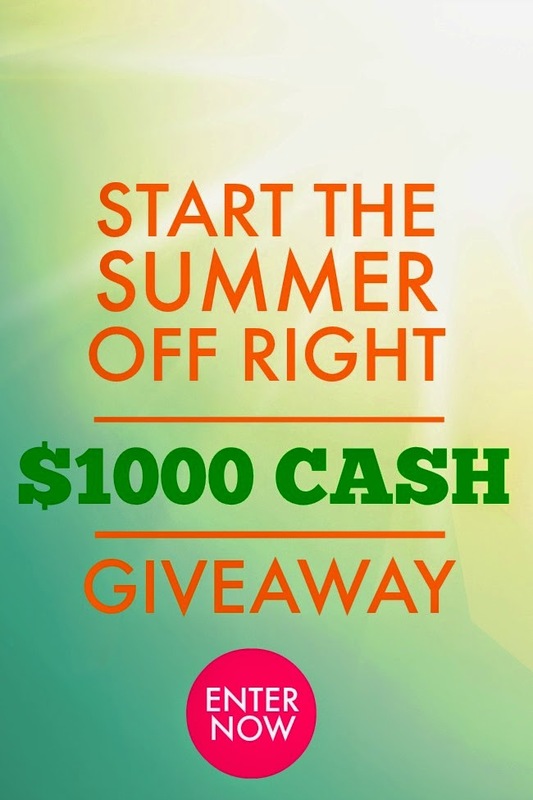 Enter to win $1000, yes $1000!!! Just think of all the fun summer things you can do with that amount of money! It's super simple and very easy to enter. But, this is one giveaway you do not want to miss out on. This giveaway could not be possible with a group of amazing bloggers and businesses including Spaceships and Laser Beams, Designed by Dawn Nicole, Fantabulosity, A Delicate Gift, Anders Ruff Custom Designs, Samantha Walker LLC, Dime Party Divas, UR invited, J'adore Lexie Couture, A Wife A Mom A Life, A-Manda Creation, Design Dazzle, Merry About Town, Sugar Sugar Cake Designs, Be Envied Entertaining, Lauren McKinsey, BellaArtista Invitations, Unlimited Party Themes, Debbie Donato, For the Love of Food, Grown Ups Magazine and Reality To Dreams. And that's not everyone!!! To see all of the sponsors, click on the Rafflecopter form at the end of the post. Eligibility and Rules: This giveaway runs from Monday, June 9, 2014 at 11:59PM EST to Monday, July 7, 2014 at 11:59PM EST. It is open to individuals over the age of the majority in their home country. The winner will be chosen randomly through the Rafflecopter form. It is the sole responsibility of the winner to report to and adhere to all laws in their respective country, which includes payments to any governing tax body. This giveaway is void in any country or territory where it is prohibited by law. Claiming Prize: The prize will be sent via PayPal. The winner must have a PayPal account to receive it. The winner also must claim their prize within 48 hours of receiving notice. If you do not claim your prize within this time frame, your entry will be void and another winner will be drawn. Please ensure that spaceshipsandlaserbeams [at] gmail [dot] com is on your "safe list." Disclosure: This is a blogger-sponsored event that is in no way affiliated with PayPal, Facebook, Twitter, Pinterest, Instagram or any other social media channel. If you have questions, email Stephanie at Spaceships and Laser Beams at spaceshipsandlaserbeams [at] gmail [dot] com. Please use the Rafflecopter below to enter! None of the entries are mandatory but the more entries you do, the more chances you have to win! Running short on time? Come back as often as you like to finish the form and maximize your chances of winning the big prize.